Crow Canyon Software will be on the expo hall floor of the upcoming Denver SharePoint Fest, showing attendees how its powerful and flexible suite of business applications for SharePoint and Office 365 can improve operations and increase productivity for any organization. Crow Canyon is a Gold Sponsor of this event, which runs May 30 to June 2, with the expo hall open May 31 and June 1. In addition, Crow Canyon will host a 30-minute presentation on its software, including its unique NITRO Application Service Layer, which powers up SharePoint and Office 365 to become true business application delivery platforms. SharePoint Fest Denver begins on May 30 with a day of pre-conference workshops, followed by a two-day conference with over 90+ sessions, and will end with a day of post-conference workshops. It will be held at the Colorado Convention Center in downtown Denver. Crow Canyon’s applications for SharePoint and Office 365 drive productivity and efficiency at organizations around the world, making SharePoint and Office 365 into truly useful and practical tools that solve real business automation problems. Crow Canyon’s goal is to engage users, streamline operations, and power continuous improvement with these applications, which include IT Help Desk, Customer Service, Employee Services, Asset Management, HR, Facilities, Marketing, Purchasing, and others. Over 5,000 customers worldwide, including major financial institutions, government agencies, corporations, military units, colleges, healthcare companies, and beyond, benefit from these powerful and flexible business applications as well as custom projects Crow Canyon has done. 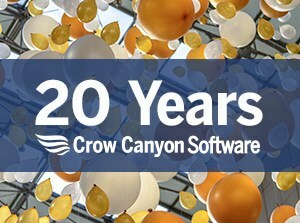 With over 18 years’ experience in developing business tools, Crow Canyon has earned its reputation as a leader in software that enhances Microsoft SharePoint, Office 365, and Azure platforms. Crow Canyon Celebrates 20th Anniversary!